What is an Arizona Quit Claim Deed? Arizona Quit Claim Deed: What Is It? In the state of Arizona, a Quit Claim Deed is a document used to transfer property from one person to the next. This type of transfer is for expeditious property transfers, and not always suitable for the traditional transaction, as a quit claim deed offers no warranty that the property is free and clear of any encumbrances. Furthermore, a quit claim deed only transfers an owners rights to a property, preventing him or her from claiming an interest on the property at a later date. A quit claim deed is generally used when transferring property between family members, or in the case of divorce. 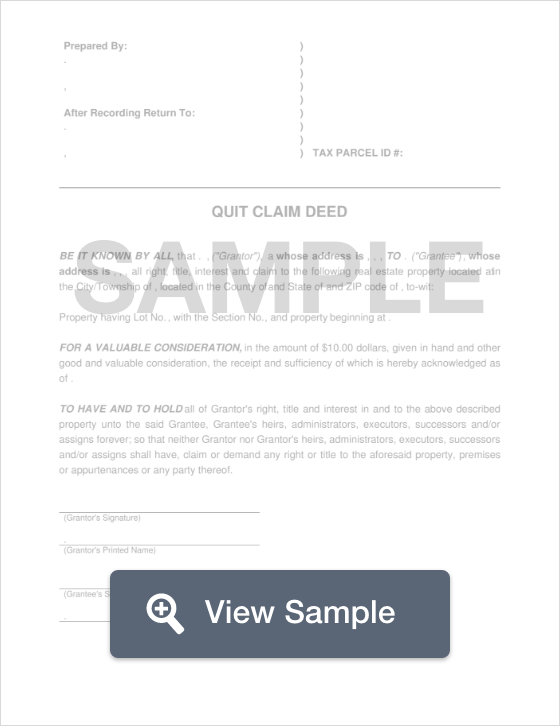 Arizona’s Laws direct how a quit claim deed should be worded (§ 33-402). According to Arizona Law (§11-468), these documents are to be filed with a local County Recorders Office that covers the area where the property is located. As far as the signing of the document, a notary must witness the Grantor’s signature before it is filed with the County Recorder (§ 33-401).